Thatch is the layer of decaying material just under the green leaf blades. So you’ve been told your lawn is suffering from a particular pest or disease due a buildup of “thatch”. You nod your head, say “Okay”, and think to yourself “so what exactly is this thatch stuff? ?” That word sure does get thrown around a lot in the lawn care industry. By its nature, it just sounds like it must be something bad, right? In reality, thatch is simply the natural layer of living and decomposed stems, leaves and roots that accumulates between the leaf blades and the soil. A thin layer of thatch is actually a natural and beneficial part of a healthy lawn. As this thin layer of thatch decomposes, it puts organic matter and nutrients back into the soil. However, too much thatch build up can be a problem. That’s when you start to see fungal diseases and pests move in, as well as weakened, shallow root systems. How does thatch harm your turf? A layer of thatch less than ½-inch thick is normal and healthy for your lawn. This layer acts as a sort of mulch that regulates root’s temperature in heat and cold, helps to retain water and improves tolerance to foot traffic. When too much thatch builds up, it starts to block water from the roots, limits air circulation and keeps fertilizers from penetrating the soil. Your grass roots will then sometimes begin growing into the thatch layer to access moisture and nutrients. Unfortunately, thatch is not balanced enough to fully sustain your lawn’s roots. If you’re over-watering, the continually moist thatch will breed fungal diseases that can weaken and kill your lawn. How does thatch build up? While some thatch always occurs naturally in a healthy lawn, certain factors will make it build up faster than it can decompose. Some species of grasses naturally form a thicker thatch layer than others. 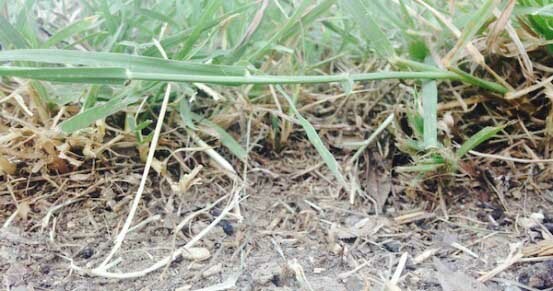 Over-watering, over-fertilizer and mowing too often can contribute to thatch build up. If you let your grass grow too tall, then mow it and leave large clippings on the lawn, this can also cause it to build up too quickly. Often, though, it’s our heavy, compacted clay soil that causes thatch to form faster than normal. Clay soils need seasonal aerating in order to allow for the faster breakdown of organic matter. Afraid that leaving the grass clippings on your lawn will cause a thatch problem? Not so, as long as you’re watering, fertilizing and mowing properly. It’s good practice to leave clippings on the lawn as they are valuable organic matter. But too much water, fertilizer or mowing can leave you with excess thatch build up. There are a few ways to tell if thatch is a problem in your lawn. If your lawn feels spongy as you walk on it, you could have a thick layer of thatch. Closely inspect your lawn. If you don’t see any crowns of turf, the thatch could be too thick. Or, if you your finger can’t penetrate the layer of thatch to touch the soil, it could be too dense. Carefully cut out a section of turf about three inches into the soil with a spade or trowel. If the thatch is more than ½-inch thick, it needs to be thinned out. If you're a Soil Building Program customer, we can inspect your lawn to see if it needs aerating and de-thatching. Give us a call. Feeding the soil and stimulating microbial growth is a great way to reduce excess thatch. Beneficial microbes, which are applied to soils in our Soil Building Program, will speed up the decomposition process and help deliver nutrients more quickly to your lawn. If excess thatch is a real problem in your lawn, it can be removed in a process called “de-thatching”. This is a mechanical process of vertically mowing your lawn so that it reaches under the grass blades to lift them up while also cutting it. De-thatching should only be performed on lawns where excess thatch is actually present. If you de-thatch a lawn that does not have a real thatch problem, you could be causing undue damage.